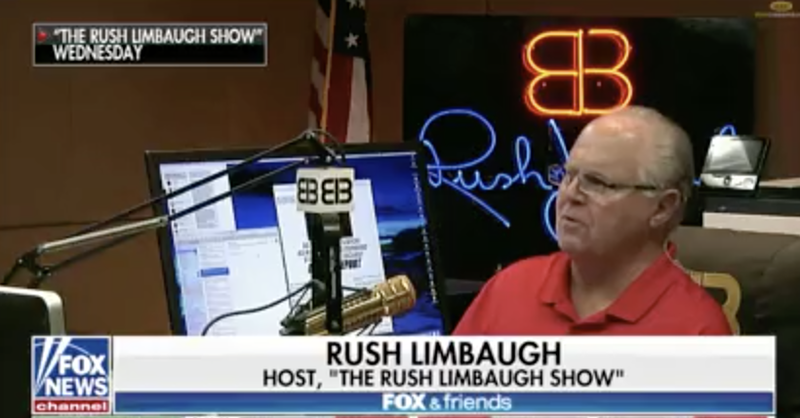 RUSH: Some think I caught some grief today on Fox & Friends. Yesterday we played a sound bite from The Oprah in which she says that people were urging her to run for president but she wasn’t gonna do it until she heard from God-d. Ergo, Oprah was saying that God-d could speak to her. 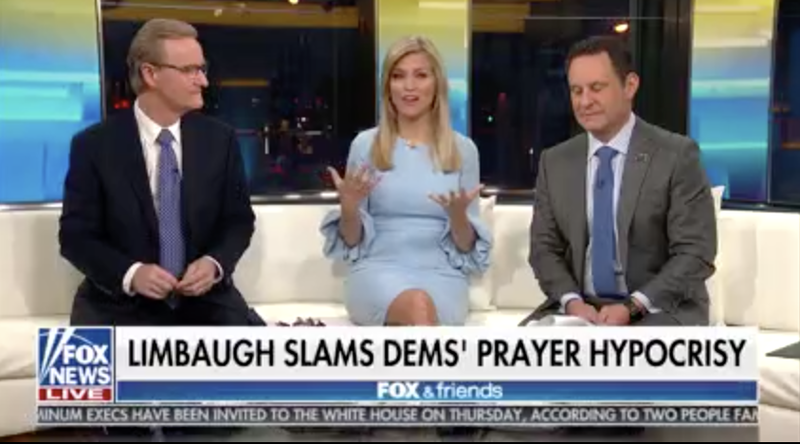 And I wondered, “Well, where are all the people on the left saying that she’s insane and that that’s insane,” like Joy Behar, Maude Behar did after Mike Pence said that he prays and talks Jesus? She humiliated him, made fun of him. By the way, they’re being overwhelmed with complaint calls, emails, faxes, tweets. ABC is drowning in these complaints. So I said, “Well, is it okay for Oprah to talk to God but not Mike Pence? Why is Oprah not being mocked?” Well, they referenced this today on Fox & Friends. Ainsley Earhardt first. 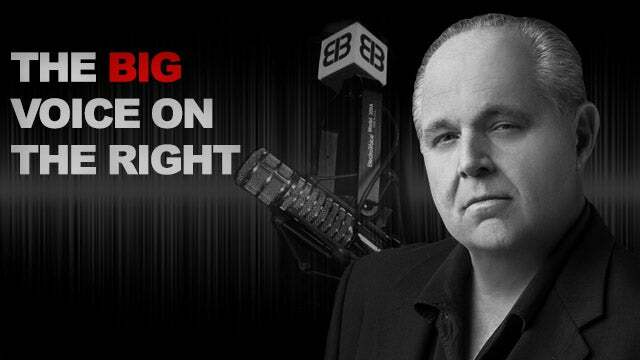 EARHARDT: Rush Limbaugh calls it a double standard. Listen to this. RUSH ARCHIVE: A liberal Democrat is gonna talk to God, and God is gonna talk back. Now, isn’t that what they’ve been making fun of Mike Pence for for about a week? It was Maude Behar on The View, mentally ill, Mike Pence is mentally ill because Jesus talks to him. It’s a big enough risk as it is for Oprah as a Democrat to acknowledge God, number one, and then she says that she will not move forward unless she hears from God in such a clear way that she couldn’t miss it. So she’s expecting God to talk to her. Anybody else see the contradictions here? EARHARDT: See, I love Oprah. I love that she is willing to talk about that and talk about her faith. And when you watched her show she was always so generous and talked about her faith a lot and was giving away cars and everything. She appreciates from where she came and what her story has been and I think she’s just a powerful woman. Clearly she’s done a lot for other people and for herself, for this country and has a great story. So I thought that was wonderful. Joy Behar, as a Christian, it makes me sad that she was making fun of him and doesn’t have that experience. So it’s hard for me to criticize her ’cause she just doesn’t know, she doesn’t know the love of what it’s like to have faith. RUSH: Okay. There you have it. RUSH: I did not! Do not put words in my mouth. I didn’t have one critical thing to say about Ainsley Earhardt. Not a single thing. I only played the sound bites to show you how this hypocrisy game works. I mean, this is not insignificant. Mike Pence is as decent a human being as is Oprah Winfrey. And he’s just as generous as Oprah. He may not have the money to give away cars, but Mike Pence is as genuine and decent and good a human being as anybody. And he happens to mention his faith and that he prays and that he gets feedback, signals, talks to Jesus or whatever. And there’s Joy Behar claiming on ABC that he’s insane, that that’s a mental illness, one insult after another from an absolute blithering ignoramus. And it’s heralded and promoted and laughed about. And then she is asked to apologize, and by her network, ABC, and there’s a quasi— really a non-apology kind of recognition of it. And then out of the blue, with the same bunch of people hoping and praying that Oprah Winfrey will run for the presidency ’cause apparently that’s the only person that could beat Trump, Oprah says she’s waiting to hear from God! She’s not gonna run until she gets a message from God! Well, that means that God has to talk to her. You’ll note that not a single person, including Mike Pence, began to challenge her mental health. Nobody claimed that Oprah’s insane. Nobody mocked and made fun of and laughed at Oprah. Quite the opposite. Oprah was given mounds and mounds of respect, all kinds of support. The fact that she admitted that she was not gonna run until she got a message she couldn’t miss from God, and not a word from Joy Behar. Joy Behar didn’t be make fun of her. Joy Behar didn’t mock her. 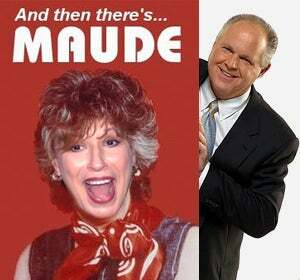 Joy Behar didn’t claim that she’s mentally insane or mentally ill or what have you. Nor did anyone else. Now, what’s the difference? In Mike Pence, the vice president of the United States, who lives his faith and proudly, happily, fearlessly acknowledges that he has a connection with his god, with Jesus, with his savior, what’s the difference in him doing it and Oprah? He is a Republican. He is a conservative. And he won’t strike back. It’s on the basis of this that I ask where is the compromise? Where is the overlap of things we supposedly have in common? We’re up against sheer hate, folks. We’re up against people who have been literally poisoned by undiluted, raw hate. I have a piece here. Right there it is. I set it aside today. I didn’t know if I was gonna get to it or not. It turns out that I have transitioned into it beautifully here. It’s a piece at Townhall written by our old buddy Kurt Schlichter. And look at this. The headline: “They Don’t Hate The NRA. They Hate You.” And his piece is essentially a wake-up call to everybody to stop misunderstanding who and what we are up against. Biggest mistake we could make is compromising with ’em on guns. Then they’ll want to take the land we own and kill us. Don’t laugh. In South Africa, the African National Congress, the leading political organization of the country, the governing organization has announced that we are going to this year confiscate all white-owned property. Seventy-two percent of property in South Africa is owned by whites. The African National Congress has just announced they’re going to seize it. There will not be any compensation. They’re just going to take it. Exactly the policy of Robert Mugabe in Zimbabwe, which used to be Rhodesia. Check out Zimbabwe, if you want to find out what life is like there. Let me give you some pull quotes from Mr. Schlichter’s piece at Townhall. “The progressives are cranking things up to 11 on the Stupid/Psycho Scale, which is good for us in the short term. Some of us Normals,” that’s how I refers to conservatives “Some of us Normals were growing complacent and the midterms are coming. But we also need to open our eyes and accept the bitter reality we face. These are pull quotes from the piece. “Understand that the left doesn’t hate the NRA. The NRA stuff is a distraction. Leftists are dumb, but they understand the power of the NRA is really the power of millions of Normal Americans.” This is so exactly right. The strength of the NRA is not the money it gives to politicians. The strength of the NRA is not the politicians it owns or the power it has, whatever that is in legislation. The power of the NRA is it’s the largest civil rights, civil liberties, grassroots group in this country. The membership of the NRA is millions and millions of the people who make this country work. And they have joined the NRA not because they love pulling the trigger. They’ve joined the NRA not because they love guns. It’s because they want to defend their rights that are endowed in the Constitution. They want to protect themselves. They want to protect their families. They want to protect their communities, and mostly they want to protect the Constitution. And they know, the members of the NRA know full well the assault and the attacks that are happening daily sponsored by the American left. And that’s why they can’t abide it. The American left wants no compromise with you. The American left wants no common ground. The American left has no desire to cross the aisle, meet you halfway. The American left wants you to not matter. He says here the left doesn’t even really hate guns, either. In fact, the progressives fully intend to be the only group left with any guns. They want guns. They just don’t want you having them. They don’t hate guns. All of what they’re doing is a giant smoke screen. There are plenty of Democrat members of the NRA, elected Democrats who are members of the NRA. They want you disarmed, they want you disempowered. Not the nuts, not the criminals. You. They hate that you won’t submit. They hate that you will not acknowledge that they’re right. They hate that you will not accept their progressive ideals. That’s Kurt Schlichter writing in Townhall today, and it fits the bill. Joy Behar is filled with a hate that she can’t control now. You know what? I will bet you, however, that she couldn’t really explain why, not truthful, not deep down honestly why she hates. Oh, she’d cite some things, but they wouldn’t be the real reason. Nor would any of the others. They don’t want to go to the level of real understanding. They just hate that you exist and that you oppose them.